IMF just published a watershed document on Corporate Taxation - relating to the tax avoidance and aggressive tax optimisation - and its effects on emerging and developed economies. Ireland features prominently in the report. A new IMF Policy Paper, titled "SPILLOVERS IN INTERNATIONAL CORPORATE TAXATION" considers "the nature, significance and policy implications of spillovers in international corporate taxation—the effects of one country’s rules and practices on others." Emphasis, throughout is mine (in italics and bold). The paper develops further the concerns about potentially harmful spillovers from corporate tax regimes in countries with regimes permitting more aggressive tax optimisation onto other economies, in line with concerns expressed by G7, G20 and the OECD and developed under the OECD framework project on Base Erosion and Profit shifting (BEPS). The IMF paper starts by arguing that tax spillovers can matter for macroeconomic performance, as "…there is considerable evidence that taxation powerfully affects the behavior of multinational enterprises. New results reported here confirm that spillover effects on corporate tax bases and rates are significant and sizable. They reflect not just tax impacts on real decisions but, and apparently no less strongly, tax avoidance." Per IMF, globally, "The institutional framework for addressing international tax spillovers is weak. As the strength and pervasiveness of tax spillovers become increasingly apparent, the case for an inclusive and less piecemeal approach to international tax cooperation grows." In other words, prepare for a greater push toward closing loopholes and harmful practices that so far have been the cornerstone of the Irish corporate tax policy conveniently obscured by the benign headline rate. In fact, Ireland is at the forefront of the problems identified in the IMF paper and it is also at the forefront of the table of countries that will lose should aggressive tax optimisation be curbed. Here's what the IMF have to say about the above evidence: "One set of questions concerns whether international corporate tax spillovers matter for macroeconomic performance. For capital movements, at least, it seems clear that they do. 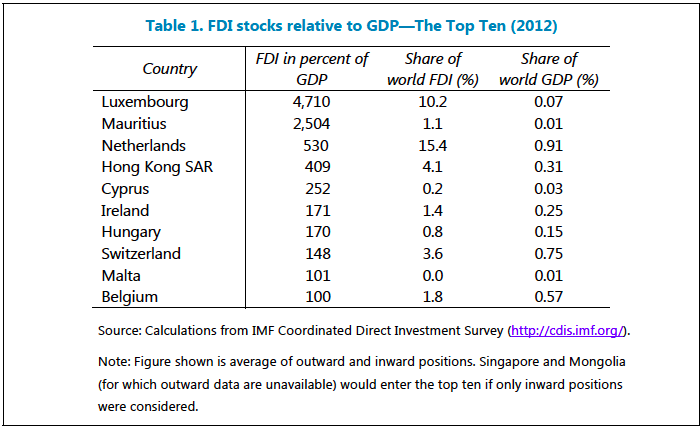 Table 1, showing characteristics of the ten countries with the highest FDI stocks relative to GDP, suggests that patterns of FDI are impossible to understand without reference to tax considerations (though these of course are not the only explanation). And the point is significant not only for some individual countries (accounting for a stock of FDI extremely high relative to their GDP) but globally (with relatively small countries accounting for a very large share of global FDI). The potential economic implications of international tax spillovers thus go well beyond tax revenue, with wider implications for the broader level and distribution of welfare across nations." On pervasiveness of corporate income tax (CIT) optimisation in the overall host economy, IMF defines ‘CIT-efficiency’ in country A as the ratio of actual CIT revenue in this country to the reference level of CIT revenue, with the latter computed as the standard CIT rate multiplied by a reference tax base… To the extent that the reference CIT base is larger than the actual ‘implicit’ CIT base [CIT-efficiency measure] will be less than unity; and the further [CIT-efficiency measure] lies below unity, the less effective is the CIT in raising revenue relative to the benchmark." Per IMF: "Variations in [‘CIT-efficiency’ metrics across countries and time] might reflect behavioral responses that affect GOS [gross operating surplus] and the implicit CIT base in different ways. One obvious candidate is profit shifting, the incentives for which are determined by differences in statutory CIT rates: if a country has a relatively high CIT rate, outward profit shifting will likely cause an erosion of the tax base, without a corresponding reduction in GOS. Conversely, for a country with a relatively low CIT rate, inward profit shifting will tend to expand the implicit base." And guess who's at the top of the global bottom-feeding food chain here? Note: CIT efficiency for Cyprus is 213 percent. Just look who is second in the world in terms of mean CIT efficiency (we know we are at the top of the world distribution when it comes to low corporation tax rate)… So remember: per IMF, high CIT efficiency combined with low tax rate = a signal that profit shifting is taking place into the economy. IMF usefully decomposes tax shifting effects for the case of US MNCs as follows. "The calculations begin with the net incomes of U.S. parents and Majority Owned Foreign Affiliates (MOFAs) by country of affiliate, taken from Bureau of Economic Affairs data… These are adjusted by the average effective corporate income tax rate in the respective country to obtain estimates of taxable income. 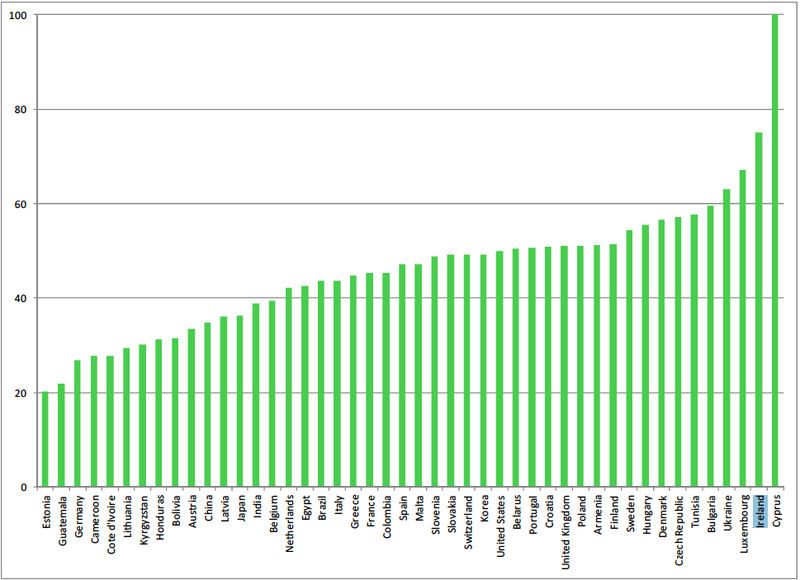 The average effective tax rate for global taxable income is weighted according to countries’ GDP. Country shares of U.S. MNEs’ sales, assets, compensation of employees and number of employees are obtained from the same tables, adding totals for U.S. parents and MOFAs in all countries. Shares of each apportionment key are applied to global taxable income to derive changes in taxable income." Here is the main kicker: "Appendix Table 8 shows the country-specific estimates… Broadly, a country gains from FA [global reforms in tax if tax were to accrue in the country where the company bases its activity that generates taxable income] on the basis of some factor if its share in the global total of that factor exceeds its share in the net income of US MNEs. That Italy, for instance, gains under all factors reflects the very low share of US MNEs net income reported there: about 0.16 percent. Whether that reflects inherently low profitability or particularly aggressive outward profit shifting cannot be determined from these data." 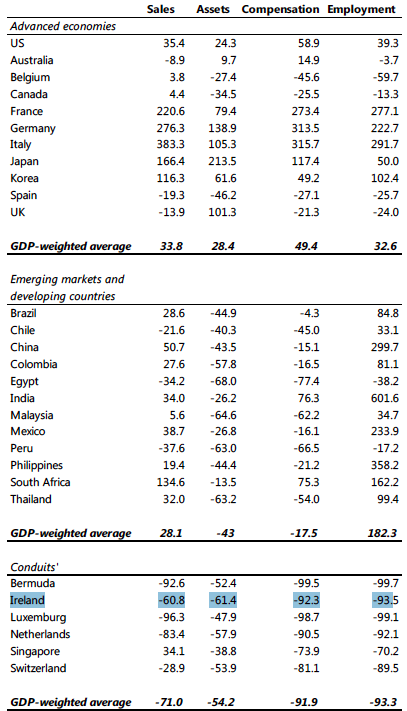 In other words, broadly speaking, positive values in the table below are when countries will benefit from tax shifting being shut down, and negative are where the countries will lose from such reforms. Alternatively - positive values show the effective losses incurred by the country from tax shifting. Negative values represent the gains to the country from acting as a tax shifting platform. third highest in terms of compensation and employment. Crucially, we are in line with such tax-transparent jurisdictions as Bermuda and Luxembourg, ahead of the Netherlands and well ahead of Singapore and Switzerland.